A big alluvial fan across the mountain ranges of Xinjiang. Alluvial fan in southern Iran. 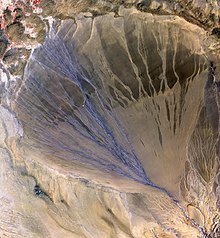 An alluvial fan is a fan-shaped deposit of soil and rocks. It forms where a fast-flowing river spreads out over a flat plain. They are usually found in between mountain ranges that are crumbling away. If it rains a lot, the fan area will usually flood. ↑ Cazanacli, Dan; Paola, Chris; Parker, Gary (2002). "Experimental Steep, Braided Flow: Application to Flooding Risk on Fans". Journal of Hydraulic Engineering 128 (3): 322. doi:10.1061/(ASCE)0733-9429(2002)128:3(322). Howard, J.M., Moore, A.D. (2005). "Large alluvial fans on Mars". Journal of Geophysical Research 110: E04005. doi:10.1029/2004JE002352. http://erode.evsc.virginia.edu/papers/moore_fans_2004JE002352.pdf. This page was last changed on 12 March 2013, at 18:07.